Jumbo is being cared for at BOS Nyaru Menteng. Just two days after the rescue of Cinta, a van pulled up to the main gate. One of the passengers was carrying a tiny baby orangutan. He claimed to have found the baby when he was out with his hunting dogs. The dogs ran towards the mother who quickly disappeared behind the trees. The man grabbed the infant who, he claimed, she’d left behind. Orangutan mothers NEVER leave their babies! 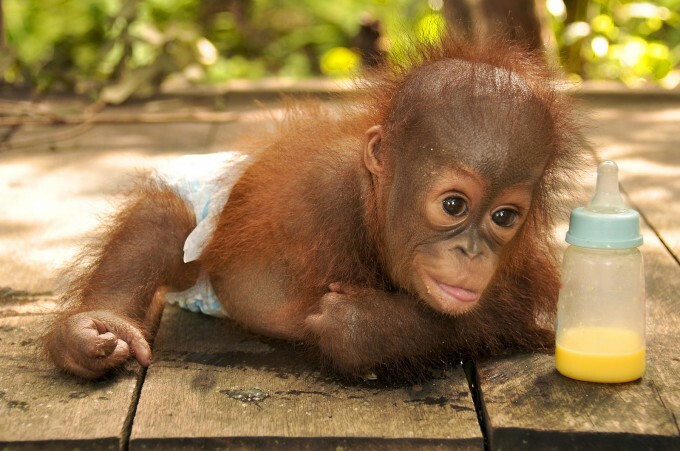 The little guy, named Jumbo, is now in BOS Baby School with his best friend Cinta. YES! I want to adopt Jumbo!